When searching through my figures for new subjects, I often come across items that I’ve already covered. Sometimes I look at them and think they deserve more exposure, or I just feel the need to talk about them again. Such is the case with this figure. 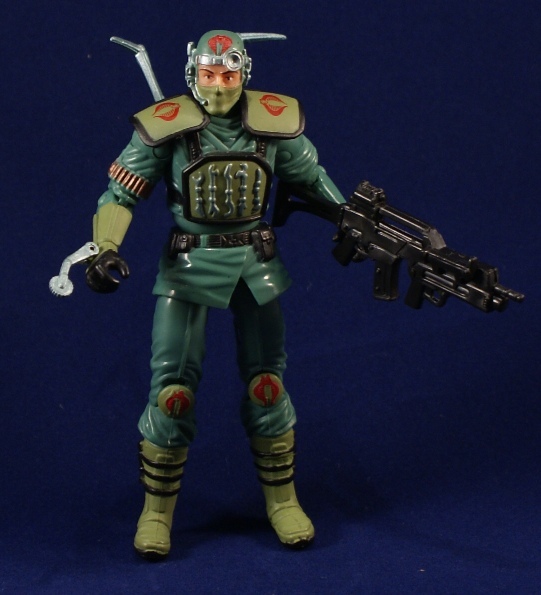 The Medi-Viper is a character that will be familiar to the Marvel comic readers or to those who have long frequented the GI Joe site joecustoms.com. Over the years, and particularly during the 2000s, this comic originated Cobra was a popular subject for customizers. This one isn’t an exact interpretation, but is a nice effort nonetheless. I’m still surprised that Hasbro chose this trooper to be part of its DTC offerings. I suppose that speaks to the collector focus the line had at the time. The C stood for Consumer officially, but we all know who the line was intended to serve. Who after all but collectors would want such a toy? I think its inclusion over a re-do of a more popular mainstay like a classic Firefly or the Baroness speaks to Hasbro’s reading of the fandom at the time. The obscure must have been thought to be more popular. I suprised it took so long for cobra to get a medic. I know theyre the bad guys but they need doctors too. I hope to see him in modern era version! Great head sculpt, but the Scalpel body has its flaws. I kinda wish he’d been done ARAH style in a comic pack or something. I just recently picked up Scalpel for the first time. He quickly became a favorite of mine out of the few “first time” characters ive purchased. So it should come as no surprise i want a couple of these DTC Medi Vipers now too. The character itself was cool enough to warrant this figure plus i kind of like the idea of Scalpel having his own squad to captain……albeit in a much different way than any other Squad for Cobra. These guys strikes the sweet spot of practical usefulness on a battlefield and sci fi/futuristic badassery . I hope to flank Scalpel with 3-4 of them as i rebuild my vintage collection and discover the early decades offerings (like this) that i missed out on.